"Is any one among you sick? He should call the elders of the church to pray over him and anoint him with oil in the name of the Lord. And the prayer offered in faith will make the sick person well; the Lord will raise him up. If he has sinned, he will be forgiven" (James 5:14-15). Who can receive this Sacrament? Any baptized person who has a serious illness, or who feels the need of strength and support from the Lord, can receive this Sacrament. It is not necessarily restricted to those who are dying. The Anointing of the Sick is often combined with the Sacraments of Reconciliation and Eucharist. These give the person additional spiritual strength and grace. 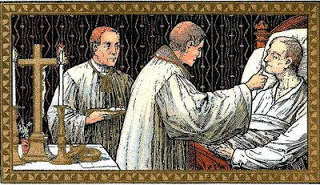 If the person is near death, the Eucharist is called “Viaticum” which means “food for the journey." It strengthens them for their journey home to God. Please call the parish office at 603-448-1262 to make arrangements for this sacrament. It can be administered anywhere (at home, in the hospital, or in church), and at any time. Because of the privacy laws, the priests of the parish are no longer allowed to call and make general inquiry as to whether a member of the parish is currently in the hospital or nursing home. Often, we can only find out about the sacramental need of a patient if a family member calls and informs the parish of their confinement.